My first morning in my new home, and this is what I’m greeted with. I’m not sure I’ll be able to hang window treatments over this view! 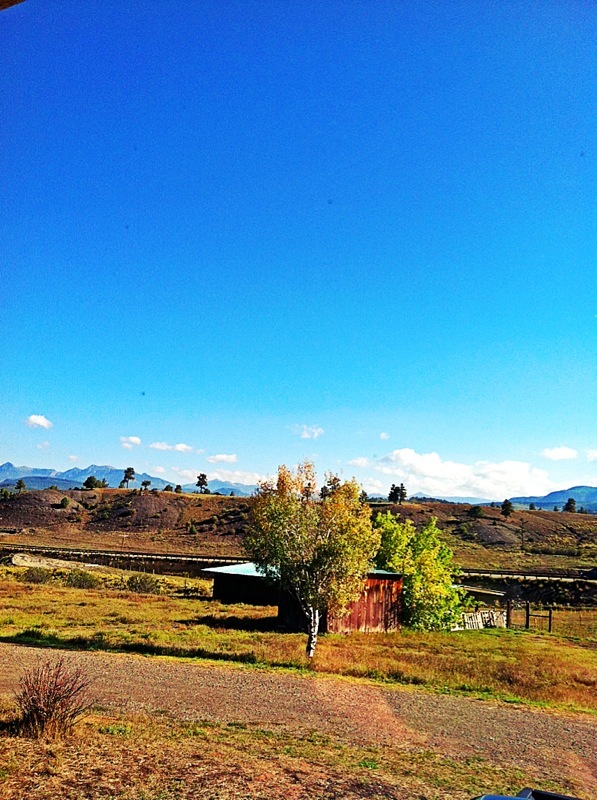 It’s so great to be here in Pagosa (and to have learned how to properly pronounce “Colorado”). Don’t have much besides the views, but that doesn’t seem to matter. Here’s hoping you’re all doing fantastically! A real rolling rustic Bounty! Haha, indeed it is, Babajij! And the home it’s shot from is even more rustic, which is why it’s not in the shot! ;) Cooked a first dish there last night, once the landlord turned on the propane and we could fire up the stove… ‘Round here, boasting a propane tank is considered a badge of independence, and truly, we are almost off the grid, if still relying on fossil fuels. It’s kinda neat! Beautiful view. The buildings across the way remind me somewhat of old mining towns out West… well, you are out West now, LOL. Glad you’re settling in. Hope you have a down jacket. Winter comes fast to CO.